Just like the sunset, the perfectly shaped circle formed by Sunset mirror moves right, creating a picturesquely unbalanced effect. The mirror is available in the silver version and in the bronze one, so to adapt to different lights. 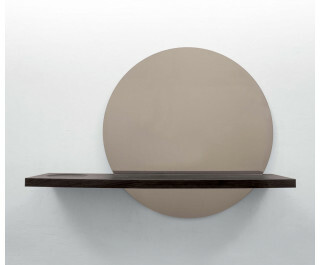 The Canaletto walnut, or dark heat-treated oak shelf “cuts” the sun just like the edge of the horizon would.